Stunning hand-wired tiara made of multi-sized Cubic Zirconia Rhinestones and scattered faceted Crystals. This Tiara beauty has an old-world scroll and subtle leaf pattern with a tall center peak. 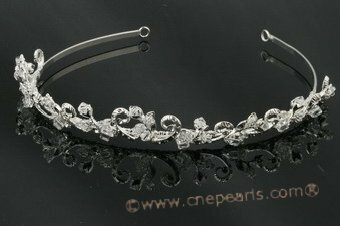 And This Floret Headband design measures almost 10 inches along 15-inch, silver-toned band and is approximately 1 inch wide. This tiara is coordinates with most bridal dress, especially white and off-white.